books « Midlife Crisis Crossover! Elegantly dressed as Ramonda, Queen Mother of Wakanda, artist Afua Richardson (World of Wakanda, Genius) made the rest of us on the premises look like slobs. …and traipse together through their Artists Alley, consistently the best assemblage of comic book creators available in any large-scale Midwest entertainment convention. 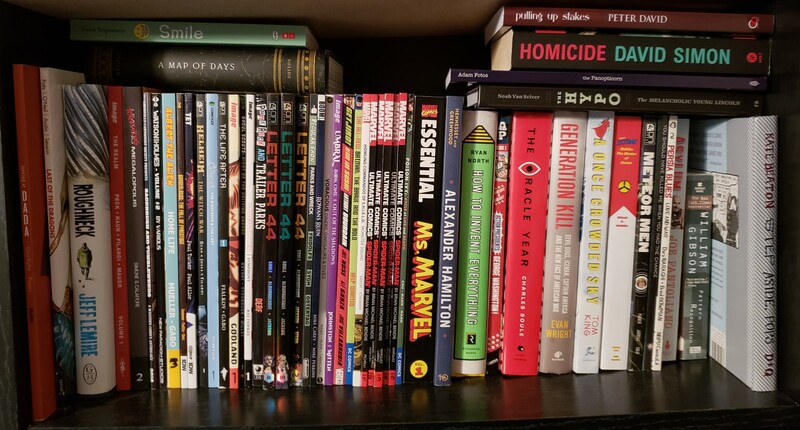 Scores of writers, artists, colorists, editors, and otherwise collaborative bookmakers gather in lengthy rows, some narrower than others, and tempt me to spend and spend and spend on new reading material, or at least brake for autographs on items I previously bought and brought along for the ride. 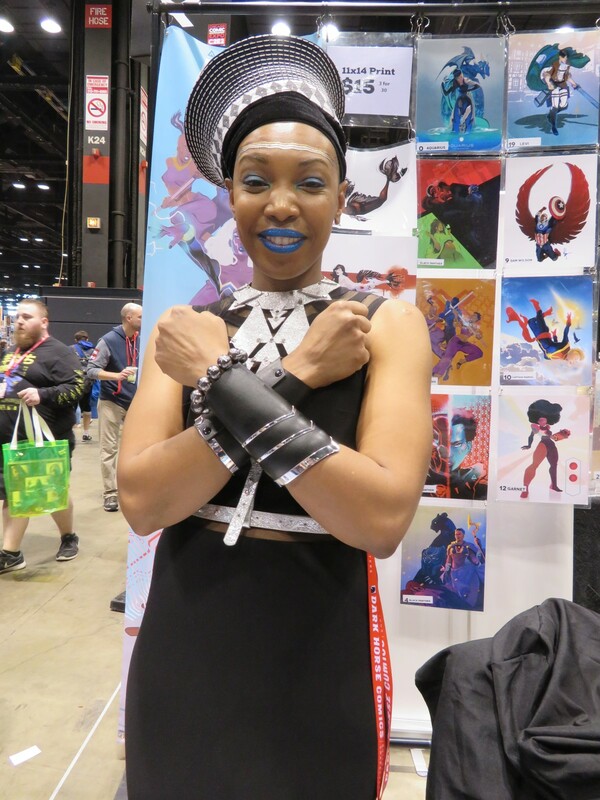 This year was naturally no exception, which is why — more than jazz hands, more than the cosplay, definitely more than publishers’ freebies — Artists Alley is my favorite part of every C2E2. I didn’t rank all 62 books in order, but here’s my Top 6 of the year. Time again for the annual entry in which I remind myself how much I like reading things besides monthly comics, magazines, and self-promotion from internet users who have me muted. Despite the lack of MCC entries about my reading matter, I’m always working on at least two books at a time in my ever-diminishing reading time. I refrain from full-on book reviews because nine times out of ten I’m finishing a given work decades after the rest of the world is already done and moved on from it. I don’t always care about site traffic, but when I do, it usually means leaving some extended thoughts and opinions unwritten due to non-timeliness. 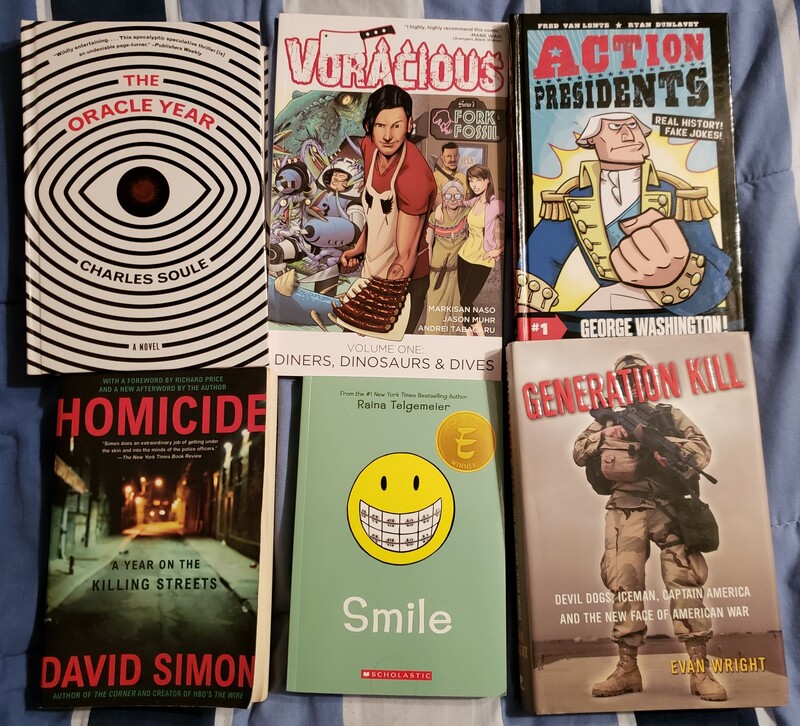 Presented over this entry and the next two is my full list of books, graphic novels, and trade collections that I finished reading in 2018, partly but not entirely in order of completion. As I whittle down the never-ending stack I’ve been stockpiling for literal decades, my long-term hope before I turn 80 is to get to the point where my reading list is more than, say, 30% new releases every year. That’s a lofty goal, but I can dream. As with last year’s experiment, every book gets a full capsule summary apiece, because 29 years of reading Entertainment Weekly have gotten me addicted to the capsule format. The list is divided into a three-part miniseries to post on back-to-back evenings in order to ease up on the word count for busier readers. Triple bonus points to any longtime MCC readers who can tell which items I bought at which comic/entertainment conventions we attended over the past few years. Part One is linked above. Part Two contained a bunch more. And now: the other part. Onward! One last time! For the trilogy! 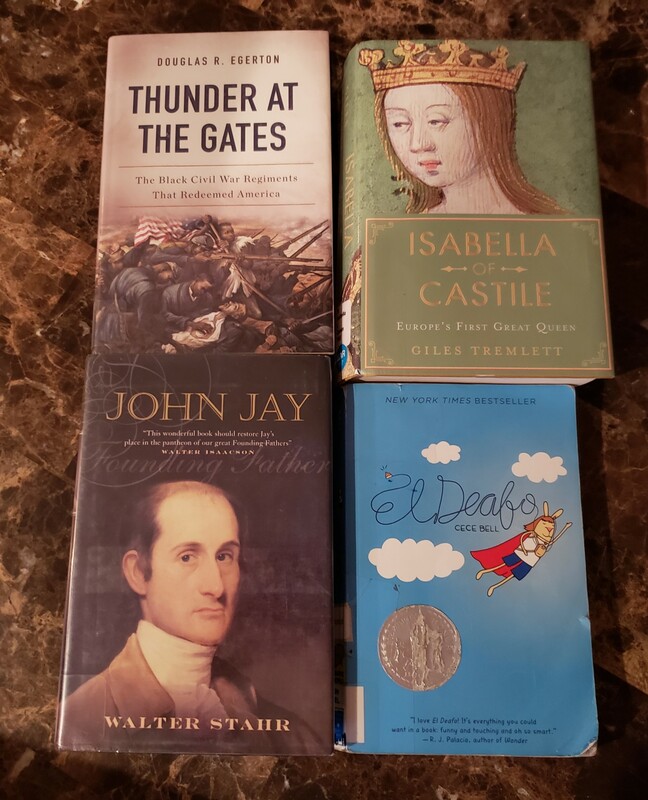 We’ll not be covering the 108 books that my wife read in 2018, but you can glimpse a few of them in this library haul. Guess which one of these four was my selection and win no prizes! Special shout-out to our local library, source of a few of the books in this section. Also, please note the numbers don’t represent rankings. They were merely to help me count toward my grand total. On with the countdown! Some more! Other than a handful of library selections not pictured, this is the complete 2018 reading list. This year’s new C2E2 reading pile. Part one. …which as always includes the densest Artists Alley in the Midwest. Eleven double-length rows of writers, artists, cartoonists, painters, print makers, button sellers, novelists, professionals, amateurs, up-‘n’-comers, elder statesmen, internet sensations, and quiet ones you gotta watch. 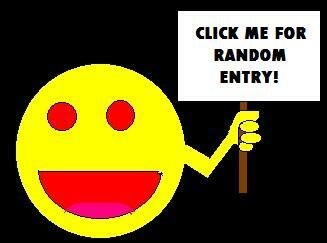 Diversity fans could find something to their tastes in virtually every conceivable corner of the medium. I tried to walk it twice per my annual ritual, and saw every table at least once — with or without their assigned artist at them — but had to bow out a few rows before the end of the second run-through when exhaustion and budgetary conscience both began tearing me down. Many talented creators put up with my wife and me within the space of a valuable moment of their time at C2E2 in between finishing commissioned sketches and other, more desirable endeavors. I made a point of throwing money at them and once again added several pounds to my reading pile and our convention bags. Anne did what she could to help me out when my back began failing under the accumulated weight, but now I owe her a new bag for the damage done. Next year I need to remind myself to wait till the end of the day before splurging on any hardcovers. 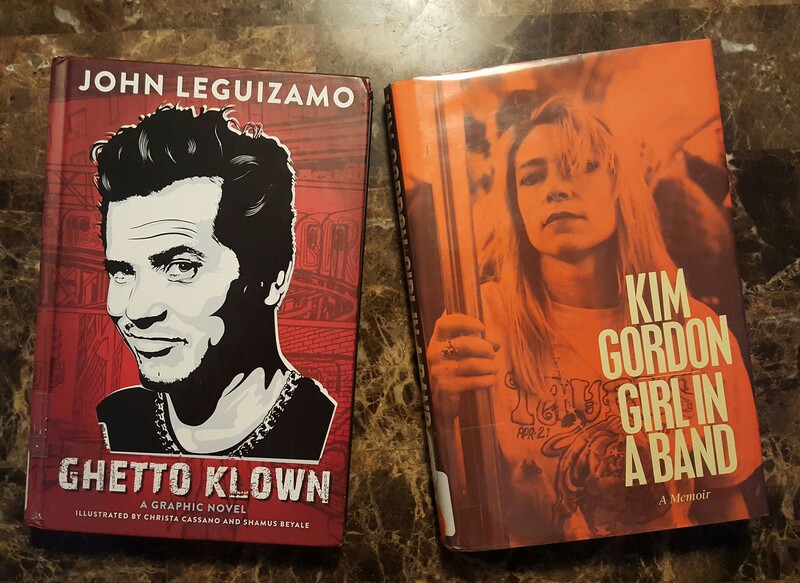 Library trip, 9/2/2017. Also, two of my favorite books of the year. 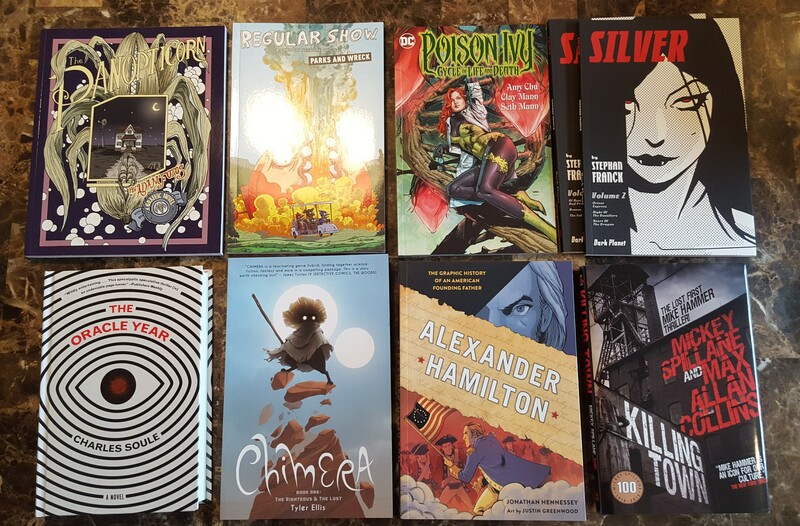 Presented over this entry and the next is my full list of books, graphic novels, and trade collections that I finished reading in 2017, not entirely in order of completion. As I whittle down the never-ending stack I’ve been stockpiling for literal decades, my long-term hope before I turn 70 is to get to the point where my reading list is more than, say, 40% new releases every year. That’s a lofty goal, but I can dream. As with last year’s experiment, every book gets a full capsule summary apiece, because 28 years of reading Entertainment Weekly have gotten me addicted to the capsule format. The list is divided into a two-part miniseries to post on back-to-back evenings in order to ease up on the word count for busier readers. Triple bonus points to any longtime MCC readers who can tell which items I bought at which comic/entertainment conventions we attended over the past few years.